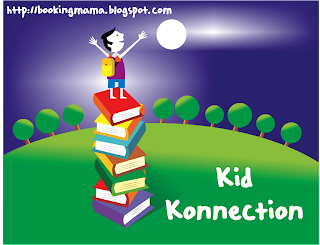 Last week, I shared with you a new idea for Kid Konnection -- a (hopefully) regular weekend feature about anything related to children's books. Today, Booking Daughter and I are going to feature our Mother-Daughter Book Club's pick of the month! This month, our mother-daughter book club read THE PENDERWICKS: A SUMMER TALE OF FOUR SISTERS, TWO RABBITS, AND A VERY INTERESTING BOY by Jeanne Birdsall. I had huge expectations for this book since I've read so many wonderful things about it (not to mention that it's a National Book Award Winner.) I really liked the book and I definitely enjoyed reading it, but I think I was just looking for a little more excitement. Now there's nothing in the book description that would have given me the idea that this book would have been action-packed, but for some reason I kept waiting for something really big to happen. It didn't -- it just wasn't that type of book. THE PENDERWICKS was an extremely sweet story though. I loved the characters, and I thought they four sisters and their friend Jeffrey were fantastic characters and very well-developed. One thing that I really liked about this book was that is just seemed so old-fashioned. The girls were very nice and there was just an air of innocence about this book. It actually reminded me a little bit of the books I read when I was a child. As a mom, I loved all of the underlying messages in this book about friendship, sisterhood and even being true to one's self. I think we will have a great deal to discuss during tomorrow's meeting. Another great thing that I think young girls will enjoy are the dynamics between the four sisters. Each sister is very different from one another, and I have no doubt that every girl will recognize themselves and their friends in these characters. In some ways, the four sisters in THE PENDERWICKS reminded me a little bit of the four sisters in LITTLE WOMEN. There was the grown up serious one, the tomboy one, the creative one, and the young one! I am very curious to hear what all of the girls and their moms thought about THE PENDERWICKS. I have already spoken with two of the moms, and they absolutely loved it! While Booking Daughter and I didn't think it was the best book that our group read, we still are looking forward to the discussion. I have a feeling that we will end up appreciating the book even more after we see the other girls' excitement. The author has written a sequel to THE PENDERWICKS called THE PENDERWICKS ON GARDAM STREET. I purchased this book right after I finished the first one because I was curious about what happened to the girls. I haven't had a chance to read it yet, but I definitely want to while the first one is still fresh in my mind. I thought THE PENDERWICKS was an okay book, but it looks like a lot of the girls in my book club loved it. In some ways, the book reminded me of the Betsy-Tacy books because they both seemed like an author from a long time ago wrote them. My favorite character was Jane. She was ten years old (the same age as me) and the third oldest (or second youngest.) I liked Jane because she was writer and she pretended to be people that she made up in her stories. I related to Jane because I like to do those things too! Having said that, she found the second Penderwick book in the library and has already started reading it. Of course, I had already bought it for her but that slipped her mind! I hope this review didn't come across that I didn't enjoy (or appreciate) the book -- because I did really like it. In fact, I'm in charge of an after-school book club for 4th and 5th grade girls, and I think I might pick THE PENDERWICKS as one of our books to discuss. Great review from both of you. I have a couple of books that will fit this feature -- now I just have to get around to reading them. I love Booking Daughter's comments - especially about the author sounding like it was written by an author from a long time ago. When you think about it, the way of playing has changed so much - now kids play "together" with computer games, for example - it must appear very old fashioned to read about a non-technological environment. Just like we react to mysteries when the person in danger is running around looking for a phone booth to call for help! I like a little "action" in my books, too, so I know what you mean. A sweet story like this is nice from time to time. This sounds like a sweet story. It is very cool that you are in a book club with your daughter. Mine are a little too old to think that would be a neat thing...but I just recently got the older one reading alot so there is still hope for the younger one. My son is a different story though and loves books! this review reminded me of the sderies "mother daughter book club" by heather vogel frederick, very sweet books also, how would your daughter like those? I felt as you did about the Penderwicks. Kind of had an old fashioned feel to it. I think I expected too much of it and so it fell rather flat for me. An ok story, but nothing that really excited me. Nice and calm though, if I remember correctly. The funny thing about the first Penderwicks book is that it really doesn't have much of a plot. Not much actually happens. I almost like the second book better since there is conflict right off the bat. The sisters are trying to solve a problem. It's predictable, but lots of fun. I noticed on Jeanne Birdsall's website that there are three more Penderwick books in the making. Yay! I liked the Penderwicks books as well. I'd like to start a book club at our local school. Should I check your archives for info about yours? I'm not really sure how it would work.